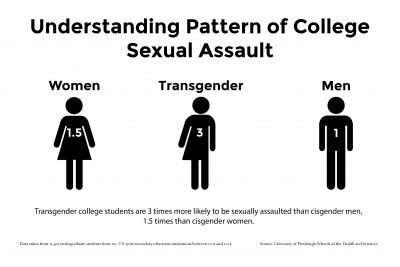 On Friday, two studies were released by the University of Pittsburgh Graduate School of Public Health about sexual assault and minorities on college campuses. The first study found that students who perceive their campus as being more inclusive of sexual and gender minority students have lower odds of being victims of sexual assault, and the second found that certain minority groups are at much higher risk of sexual assault than their majority counterparts. Robert Coulter, the lead researcher on both studies, said the first study was prompted by research that showed LGBT people were at greater risk for being victims of sexual assault than their heterosexual, cisgendered peers. Coulter and his team analyzed 71,421 undergraduate student surveys from 120 universities in the United States between 2011 and 2013. The results showed a significant association between a campus’ culture of inclusivity toward LGBT students and lower rates of sexual assault, Coulter said. However, the study only accounts for correlation and not a direct cause and effect between the two figures. The second study that Coulter led examined the intersections of sexual and gender identity, race, ethnicity and the risk of sexual assault. “That kind of research can identify subgroups that are at particularly high risk for sexual assault victimization, thereby informing prevention and treatment research, showing that they need to reach these vulnerable populations,” Coulter said. Coulter said there are many ways schools can go about creating a culture of inclusion. BU spokesperson Colin Riley said BU’s Sexual Assault Response and Prevention Center’s Step Up Step In program works to address issues like these. Coulter said the first step in solving this problem is knowing that LGBT students and specific racial and ethnic minority subgroups are at greater risk for sexual assault victimization. “That’s really important because schools like BU need to be prepared to treat these students for any sexual assault victimization, but they also need to be prepared to prevent sexual assault among these minority groups on their campuses, and I think that’s the greatest takeaway,” Coulter said. Carrie Preston, the director of BU’s Women’s, Gender and Sexuality Studies program, wrote in an email that BU, like all institutions in our culture, needs to work harder to ensure that people of all genders and sexualities, races, ethnicities and socioeconomic classes feel included. Preston wrote that although it is good that BU has acknowledged it lacks significant diversity, more needs to be done to make effective changes across campus. Several students said they thought BU did pretty well at creating a positive climate. Arianna Davis, a junior in the College of Arts and Sciences, said the culture of acceptance that you experience depends upon whom you spend time with. Serene Bahi, a sophomore in the College of General Studies, said she thinks BU has a lot of options available to help prevent sexual assault. Logan Capone, a CAS junior, said that without personal experience, it’s hard to tell whether BU has an inclusive climate toward minorities or toward preventing sexual assault.